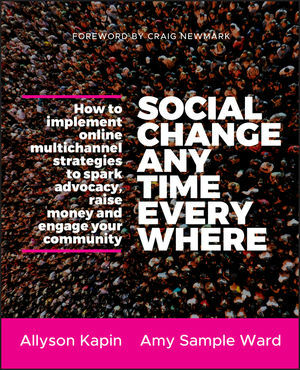 Social Change Anytime Everywhere was written for nonprofit staff who say themselves or are asked by others, “Email communications, social media, and mobile are important, but how will they help our nonprofit and the issues we work on? Most importantly, how the heck do we integrate and utilize these tools successfully?” The book will help answer these questions, and is organized to guide readers through the planning and implementation of online multi-channel strategies that will spark advocacy, raise money and promote deeper community engagement in order to achieve social change in real time. It also serves as a resource to help nonprofit staff and their boards quickly understand the evolving online landscape and identify and implement the best online channels, strategies, tools, and tactics to help their organizations achieve their missions. Allyson Kapin is the cofounder of Rad Campaign, one of the leading Web agencies serving the nonprofit community. She helps nonprofit organizations and political campaigns create dynamic and award-winning Web sites and online marketing, fundraising, and social media campaigns. Amy Sample Ward is a trainer and speaker focused on technology and social impact who works with nonprofits of all sizes around the world to use technology in their community impact. She is also the membership director at NTEN (Nonprofit Technology Network), a member organization devoted to helping nonprofits use technology strategically.